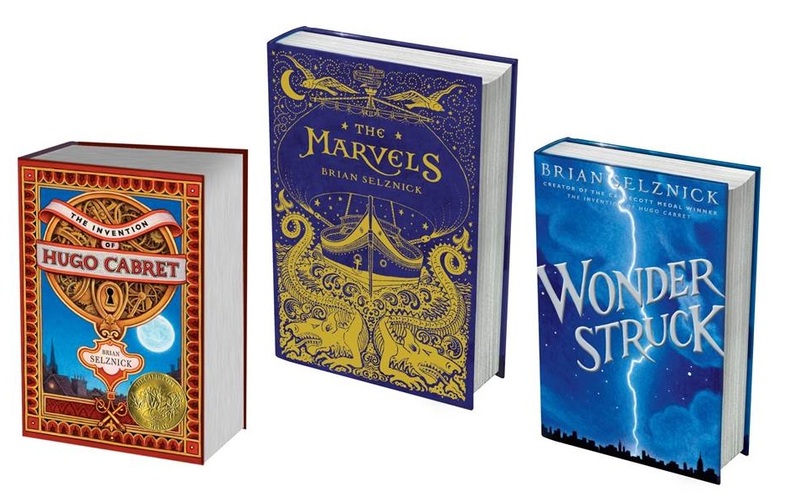 I am smiling as I sit down today to share thoughts inspired by The Marvels (2015), the newest beautiful book by award-winning author/illustrator Brian Selznick. 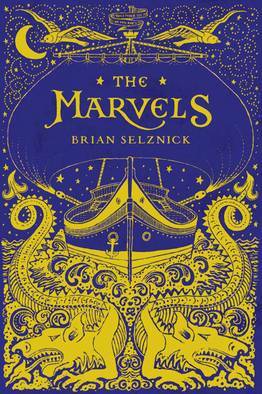 The Marvels continues the hybrid format—interspersing pages of prose with pages of wordless visual narrative—that Selznick pioneered in The Adventures of Hugo Cabret (2007) and Wonderstruck (2011). In Selznick’s three books, tracing the stories told through pictures and then piecing together their meaning in relation to the prose make the very process of reading (or rereading) its own mysterious, very satisfying adventure. I certainly looked forward to and enjoyed rereading Hugo and Wonderstruck before sitting down to blog today! Growing older, I take different pleasures in rereading than I once did. Not surprisingly, some of my insights and needs have changed over the years. I marvel now at how I view some characters in Great Expectations, Kidnapped, and A Wrinkle in Time differently than I did decades ago. Similarly, Yeats’ collected poems sometimes resonate differently for me than they did before I had my own silver hairs. These works are four of the seven tomes that book loving, thirteen year-old Joseph Jervis hauls along with him when he runs away from boarding school in The Marvels. They provide this 1990s British character with another form of escape into new worlds, and Selznick suggests Joseph rereads them as compulsively as many tweens and teens do their own favorites – as I myself once reread. Selznick himself is ruefully well-aware and supportive of the different ways we understand life lessons and absorb stories: the epigraph in The Marvels, repeated several times throughout the book, is “You either see it or you don’t.” A casual or younger reader might not see all the connections in this book’s lengthy visual family history, beginning in 1766 and spanning more than 200 years and 400 pages. Such a reader also might not have interest in the author’s Afterword, which explains how The Marvels’ sometimes fantastic coincidences and events sprang from an unusual British “museum” one may actually visit today, the Dennis Severs House in London. Yet The Marvels may be savored on this more casual, incomplete level as well as being relished by readers who read closely—and reread carefully, if not compulsively. Its pleasures are multiple, whether “You either see it [fully] or you don’t.” Whether readers here remember Great Expectations as a well-loved classic or are taking note of this title for the first time is ultimately immaterial. The same can be said about Selznick’s references to several plays by Shakespeare. Knowing their plots enhances appreciation of The Marvels, but is not crucial to its own plot. Similarly, knowing about the AIDS epidemic of the 1980s and 90s adds another dimension to the mystery Joseph and his new friend Frankie solve, but this knowledge is not needed to comprehend the heartbreak of another main character. The only limits on readership of The Marvels I would point out are the ones bound up in its hardcover heft: more than 600 pages of high-quality paper, edged in gilt, may be a lot for some readers (young and old) to physically handle comfortably! I myself think this sumptuous tactile experience well worth the bother, even though an e-book version is also available. 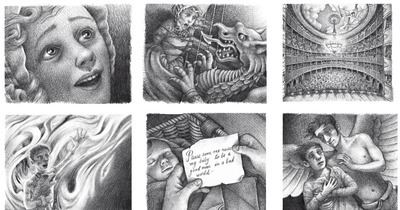 Unlike Hugo Cabret and Wonderstruck, works which intertwine their visual storytelling throughout each volume, The Marvels only employs wordless storytelling to begin and end the book. But what a remarkable, engrossing beginning and ending these are! We are caught up in the sweep of their mysteries, told in double-page spreads drawn in Selznick’s characteristic style: cross-hatched, deeply-shaded black-and-white penciled images that capture people and events in realistic detail. 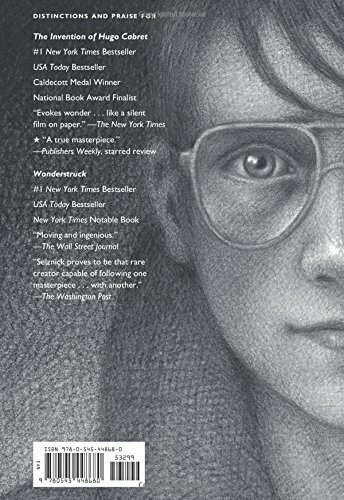 This realism makes each twist and turn of events an even bigger, more emotional surprise—emotions further enhanced by Selnick’s cinematic use of close-ups and shifts in perspective. These techniques very effectively spotlight dramatic moments and convey shifts in time and place. What seemingly begins as a fantastic adventure—a young woman being threatened by a fierce sea monster—turns into the more realistic tragedy of a fatal storm at sea. And that young ‘woman’ turns out to be Billy Marvel, the twelve-year old boy who by a series of coincidences founds a 200 year-long acting dynasty, the book’s eponymous Marvels, famed for their Shakespearean roles. Boys playacting women, a shipwreck, abandoned babies, stern parents, girls pretending to be boys, rediscovered relatives, friends and lovers separated by cruel fate but later reunited—these are all very Shakespearean situations (for those familiar with the Bard). And these classic plot elements are echoed in Joseph Jervis’ 1990s experiences, which wrap up in a 40 page, wordless ending that carries his marvelous story forward into Joseph’s adulthood in the year 2007. I will not spoil the pleasure of the satisfying symmetries and surprises there, taking my cue from Selznick himself and noting “You either see it or you don’t,” a maxim which applies to how one views life as well as fiction. Not certain or hearing questions about what has taken place in adult Joseph’s life by 2007? I respectfully suggest some rereading . . . and of course I would be happy to have you comment here! Have you read or reread The Adventures of Hugo Cabret yet? I encourage you to experience its fast-paced reimagining of early movie history. Similarly, go be dazzled—whether for the first time or the second—by Wonderstruck, Selznick’s take on Deaf culture and education in 1920s and 1970s U.S.A. As a longtime Minnesotan, I was particularly tickled to reread Wonderstruck because one of its twined stories begins in our state’s northern Gunflint Trail area. 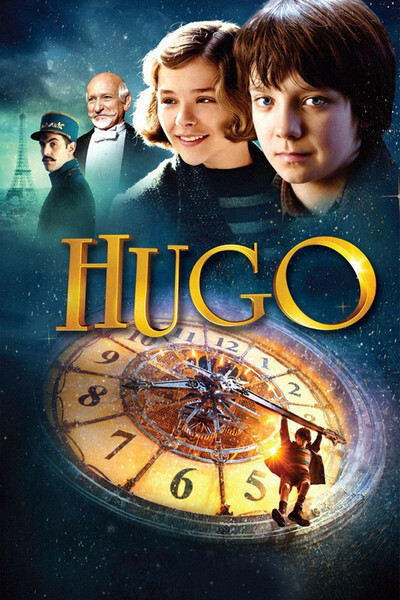 Or, treat yourself and your young readers to a viewing of Martin Scorsese’s award-winning 2011 film version of Hugo. Selznick also authored a well-received book about the making of this movie, The Hugo Movie Companion: A Behind the Scenes Look at How a Beloved Book Became a Major Motion Picture (2011). Perhaps The Marvels will inspire you to search out a print or filmed version of one of the Shakespeare plays it mentions. 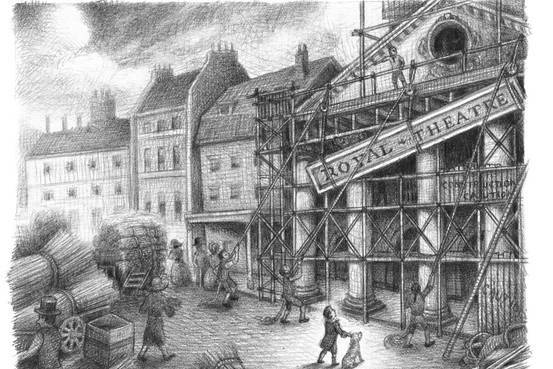 You and young readers might begin together with one of the many brief scenes from these plays already freely available online. As for me, I recently noticed a much shorter Brian Selznick picture book displayed for Halloween at my local library. I look forward now to catching up with 10 year-old Alonzo, the central character in Selznick’s spooky The Boy of a Thousand Faces (2000). This entry was posted in graphic novels, hybrid books, picture books and tagged A Wrinkle in Time, AIDS epidemic, Brian Selznick, British characters, compulsive rereading, Deaf Culture, deaf education, Dennis Severs House, early movie history, Great Expectations, Gunflint Trail, Hugo, hybrid novel, Kidnapped, London, Martin Scorsese, Minnesota, picture book, rereading, Shakespeare, The Adventures of Hugo Cabret, The Boy of a Thousand Faces, The Hugo Movie Companion: A Behind the Scenes Look at How a Beloved Book Became a Major Motion Picture, The Marvels, tween and teen readers, Wonderstruck, wordless storytelling. Bookmark the permalink.